Halloween Tree, a photo by Rootchopper on Flickr. 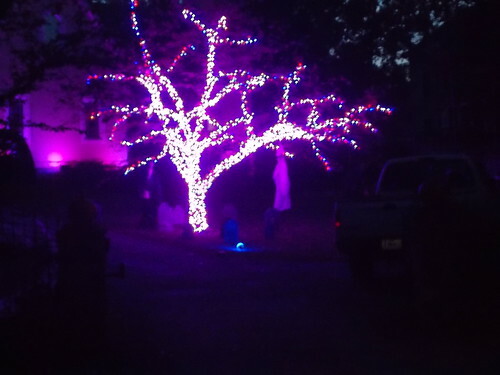 On my ride home from work I stopped to admire this lighted tree just up the street from my house. Boo! 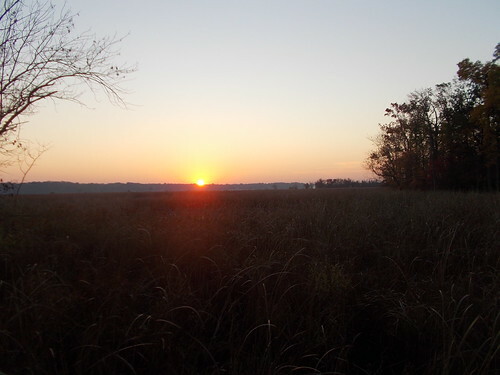 Sunrise Dyke Marsh 10/29/13, a photo by Rootchopper on Flickr. 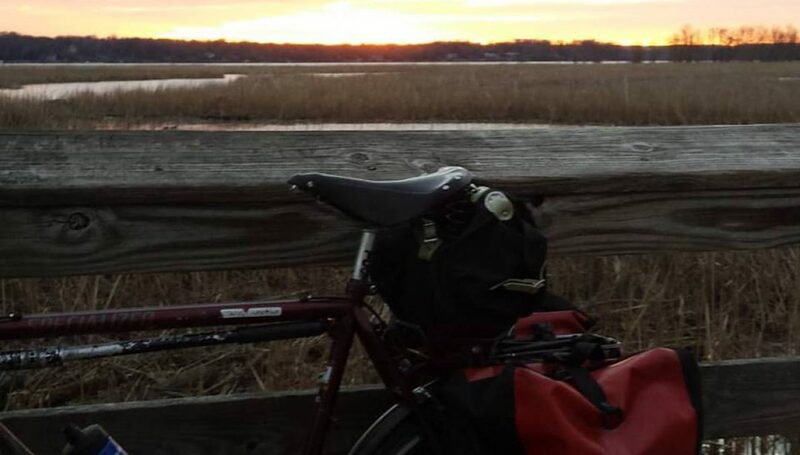 Just a few more days until daylight savings time so I am appreciating these sunrises on my bike commutes. I’ll get a few more around late December and early January. Every one is like a piece of the best chocolate you ever ate. Yum! Location: Port City Coffee at Eastern Market. 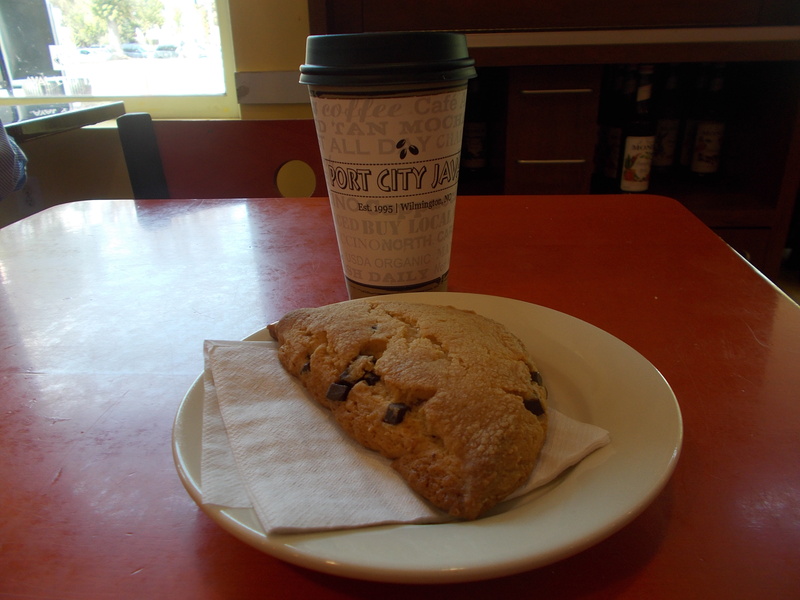 Brew: House roast with a chocolate chip scone. Observation: As good as the coffee and muffin were, the ensuing root beer float was better. Observation: Hugo is the cutest coffeeneur hands down. Observation: Meant to go to Occoquan but was frustrated by the closure of a road through Fort Belvoir. Observation: Leather sofas are more comfortable than leather saddles. Observation: The coffee and the vibe of this place make me want to go back. Definitely one of my favorites. Sorry no photo. Kate and Froggie remain mysterious and anonymous. 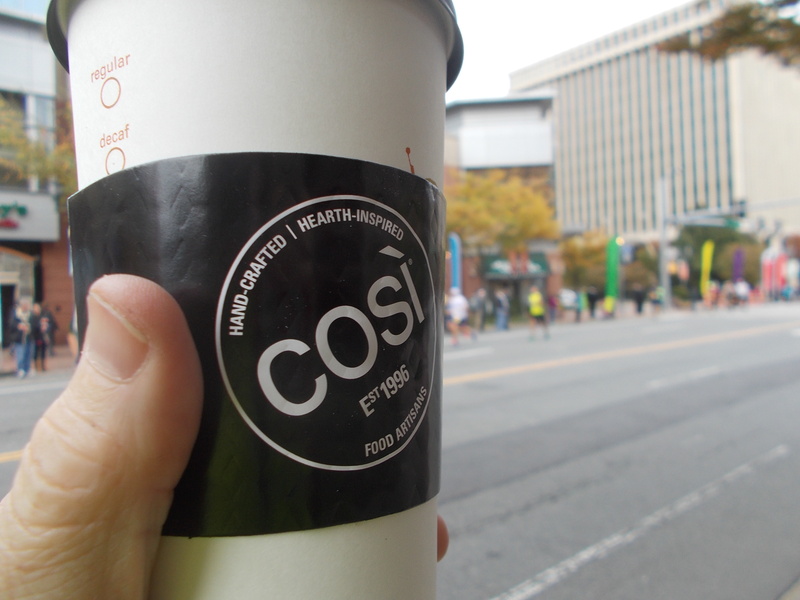 Observation: When cheering on the Coffeeneurista, the Queen of Caffeine, as she ran the Marine Corps Marathon, one must drink the drink. There you have it. Finis. 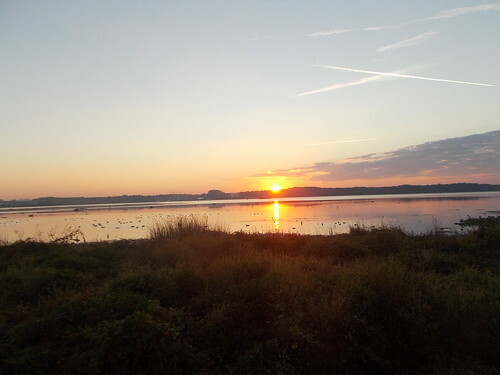 Potomac Sunrise 10/28/13, a photo by Rootchopper on Flickr. It was cold and I was tired. I didn’t much feel like riding my bike to work. I did anyway, of course. After a couple of miles I warmed up and was pedaling easily along the river. When the sun came up, I looked across the Potomac River and saw this. I had to stop to take it in. The picture doesn’t do it justice. After the game, I went to bed and came to at 7 am. It was about ten degrees warmer outside than yesterday, perfect running weather for the Marine Corps Marathon. Not so much for riding the 10 miles to the race and standing on the sidelines. My friends Heather and Mary, both randonnistas, were running so freeze we must. I took Little Nellie because it is the most maneuverable bike I own. I meant to ride slowly but a tailwind pushed me to Crystal City with little effort. The runners were already coming through the streets in the 23rd mile of the race. 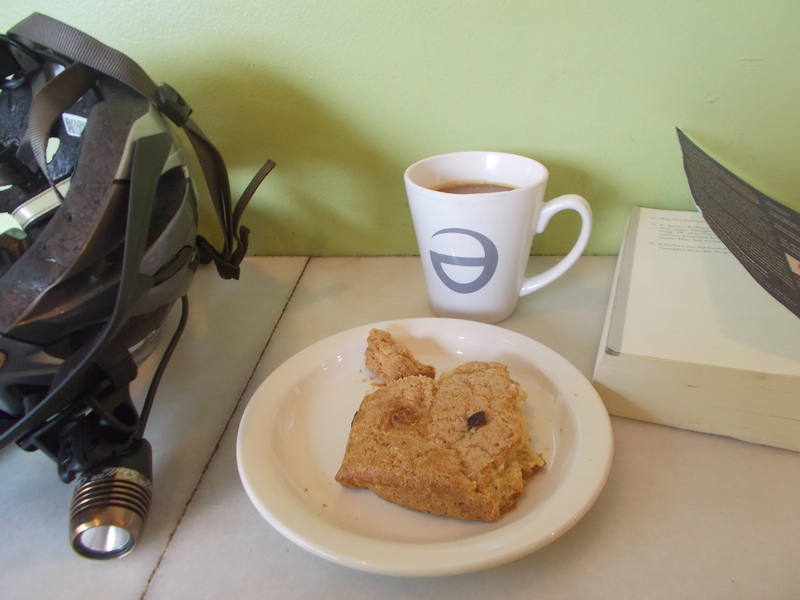 I stopped at Cosi for a coffee and a cookie. 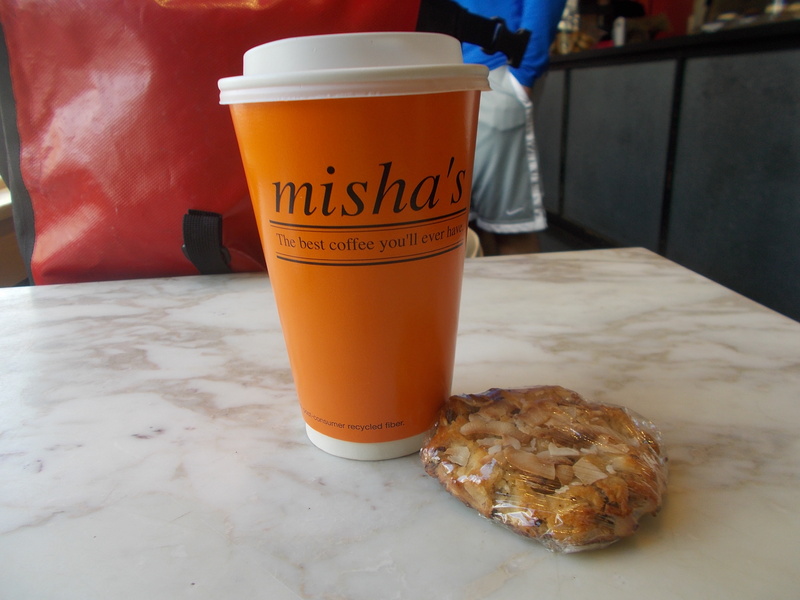 I sipped my joe and snarfed my cookie while hundreds of runners streamed past. Music was blaring. People were cheering. I checked my twitter feed. Mary had just past the 15 mile mark. I hopped on my bike and headed upstream. I rode the Mount Vernon Trail two miles north. On the way I was passed by five BMWs, engines screaming, going perhaps twice the speed limit on the parkway next to me. I realize that not all BMW drivers are complete assholes but these five certainly were. What a great idea. Let’s drive 80 miles per hour into an area filled with distracted people milling about trying to spot their loved ones running a marathon with 30,000 other people. Brilliant. Somehow I spotted Heather in the throng. She was moving along at a respectable clip with a smooth gait but she looked a little stressed. She said she wasn’t having a good day as she went by. Hang tough, Heather. Watching for somebody in a moving mass of people for a half an hour is really not easy. 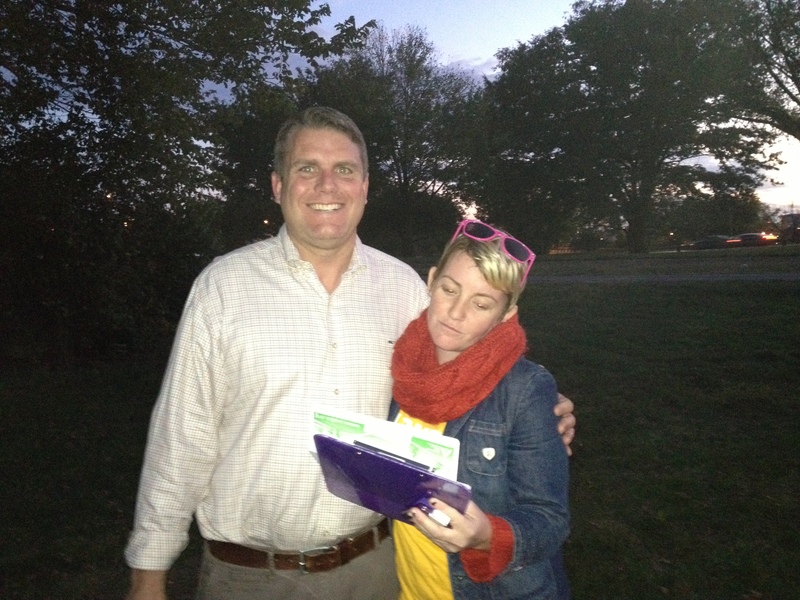 Fortunately, Mary’s husband Ed had tweeted a picture of her from mile 15. I knew what she was wearing so I could key on that. After ten or 15 minutes there she was. She had an ear to ear smile on her face. Marathon? What marathon? She stopped to chat and admired the Acorn handlebar bag on Little Nellie. And then she was gone in the flow of humanity. With temperatures climbing near 60 degrees I thought about doing some sun tanning. Instead I peeled off my boots, long-fingered gloves, and neck gaiter, hopped on the bike, and headed for home. 29 miles of coffeethonning in the books. The Washington Area Bicycling Association (WABA) is a membership funded bicycle advocacy organization. They’ve been hard at work for over 40 years helping the DC area become a better place to ride a bike. This week they are holding a membership drive so I volunteered to help out at a sign up location on the Mount Vernon Trail near the 14th Street Bridge. I arrived early and waited for the WABA staff person to show up with the sign up materials. It was warm and the sun was still shining. At around 5 o’clock I saw something that I have not noticed before. There was a torrent of bicycles streanming down the ramp from the bridge. This was especially surprising to me since I hadn’t seen many bike commuters in the morning. They were coming fast and all I could think of was how do you get them to stop? Then, as if by a miracle, a rider stopped. Lolly did her smartphone thing and I ran off with the chalk to write on the trail to the north and south. More ballpark vending ensued. This is TOTALLY not like me. I was really uncomfortable, but no guts, no glory. Another person stopped and another. One was a guy who had let his WABA membership lapse. He originally joined in 1973! He re-upped. Go team! 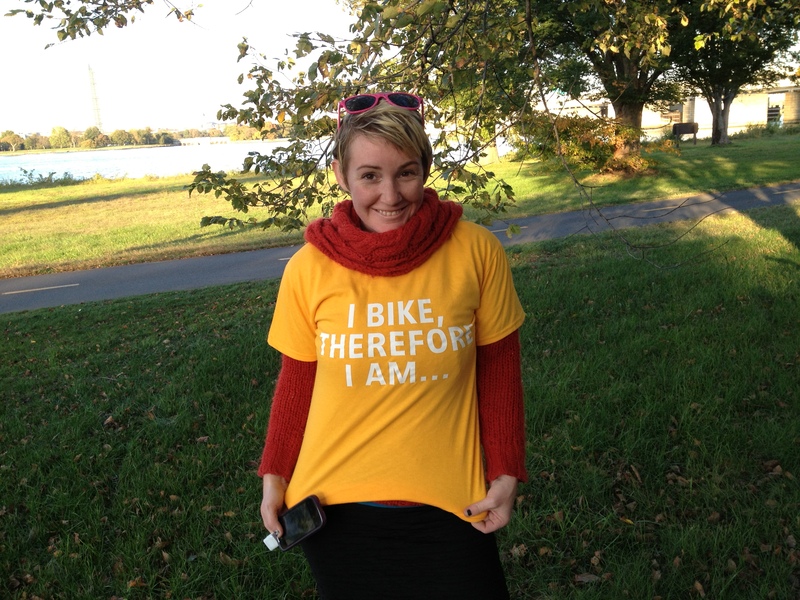 Dana, a jovial and somewhat insane bike commuter and frequent attendee at cycling get-togethers like Friday Coffee Club and the Third Thursday happy hour, stopped and pitched in. His voice and enthusiasm project better than mine and he worked the trail like a man possessed. More and more people stopped to sign up. I kept barking out my pleas for members. “Sign up for WABA or I’ll kill my cat!” (Note: I don’t own a cat.) Dana handed out some chewing gum to us which helped immensely as I was starting to lose my voice. Our numbers grew again when Larry showed up. He had walked over for the Columbia Island parking area on the opposite side of the George Washington Memorial Parkway. Unlike the rest of us, he looked like a grown up in normal office clothing. He started right in soliciting memberships. Somehow he managed to speak entire sentences to passing cyclists. Meanwhile, I was falling to my knees shamelessly begging for people to sign up. An old school DC lawyer once was overheard telling his protégé. “Never be afraid to make a fool of yourself for your client.” I took his advice to heart. After a while Dana rode off. Thanks, for helping. We really couldn’t have done it with out you, sir. 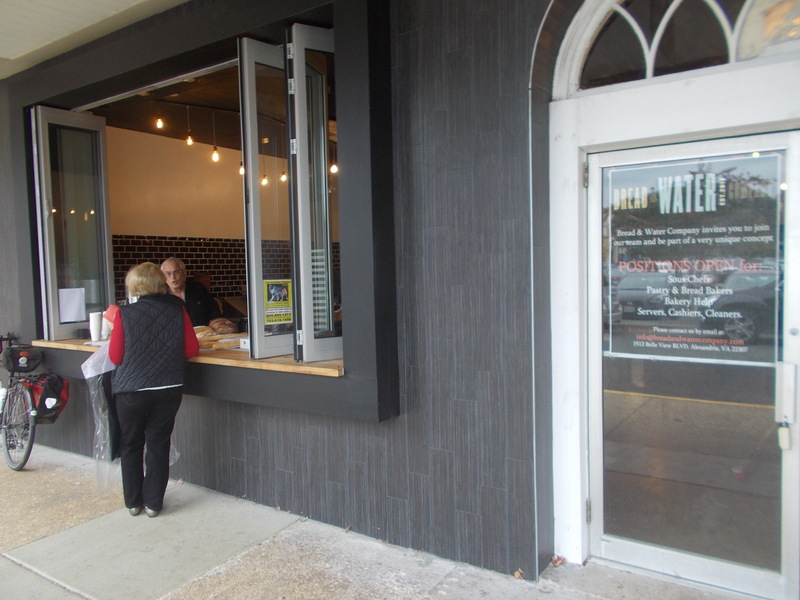 WABA owes you a tall latte and a fritter. Occasionally, people would stop by to chat. An “old” (hey, he looked about my age but he self identified as old) man came by with a big yellow bucket sitting on the top tube of his bike. He had a fishing rod, broken into two parts like a pool cue, strapped to the top tube a well. The bottom of the inside of the bucket was covered with bait fish. He didn’t sign up but he talked a blue streak about fishing and his 1955 gas guzzling Chevy. I tried to be polite but the cyclists were still passing by and the sun was setting. What made it doubly stressful is that (a) I don’t know diddly about fishing and (b) I am an introvert (see above). After about five minutes, he rode off to land the big one. In the process of the event, Darren Buck stopped by. We hadn’t met in the flesh before, but knew each other from various Internet dicussions. He will be working the same site on Thursday night with WABA’s Alex. 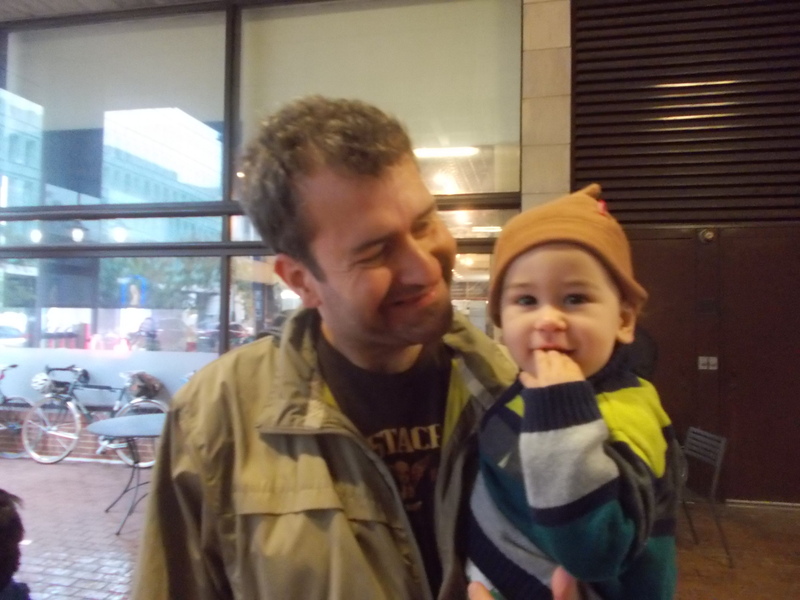 Also Lane, one of the DC randos and a Friday Coffee Club regular, blew on by with a wave. And Bike House Chris, who was in the 2013 Hoppy 100 posse and an excellent two-bikes at once rider, came by to shoot the breeze. We called it a night as the sun set. Lolly was a happy camper with a great big pile o’ memberships. Larry walked off into the sunset. Big Nellie and I rode off into the dark with my introversion restored. 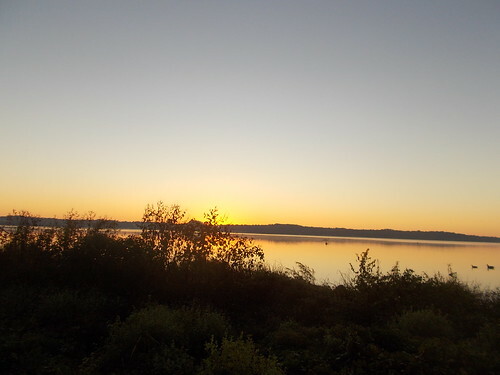 Potomac RIver Sunrise October 21, 2013, a photo by Rootchopper on Flickr. It was the first cold bike commute of the year. 40 degrees is plenty cold enough for me. I was warmed up in a mile and the tailwind made the transition to true autumn weather a breeze (sorry). I stopped along the river to admire the sunrise. Reason number one to bike commute. The ride home was warmer but the headwind was not a lot of fun. As I was climbing out from under the Woodrow Wilson Bridge I heard a SMASH. When I reached South Washington Street I saw the car with its front left side all smashed in. Reason number two to bike commute. Tomorrow I will be helping the Washington Area Bicycling Association sign up new members on the Mount Vernon Trail at the 14th Street Bridge. Stop by, say hello, set a spell. And become a member. It’s like a cult only more better. For the record my commute is about 30 miles round trip. I am nowhere near as fit as the guy in the article. Then again, I actually have time to sleep. So you’d think I’d take the day off the bicycle. Think again. 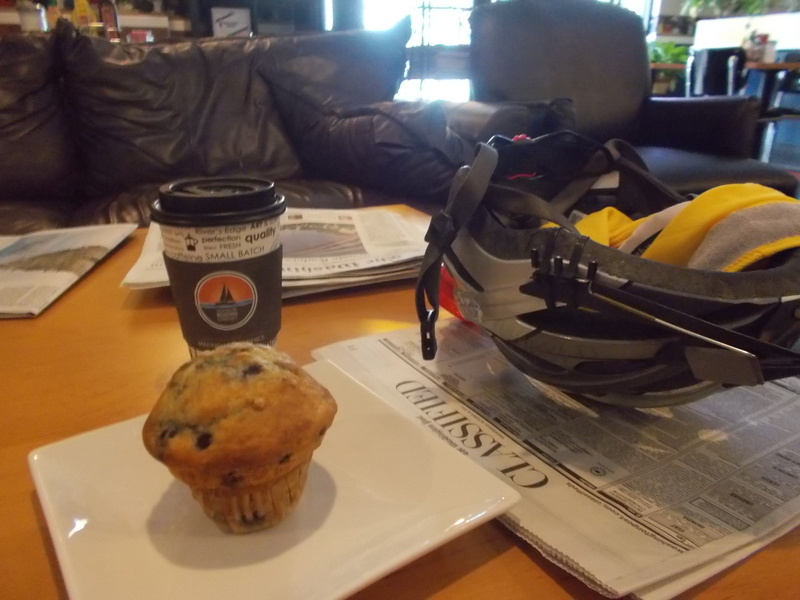 I decided to go for a short ride to get some coffee and add to my coffeeneuring madness. So I hopped on Big Nellie and made my way ever so slowly to Old Town Alexandria. My left quadricep felt like lead. The was no elasticity to it for most of the trip. Twas a struggle (Twas? 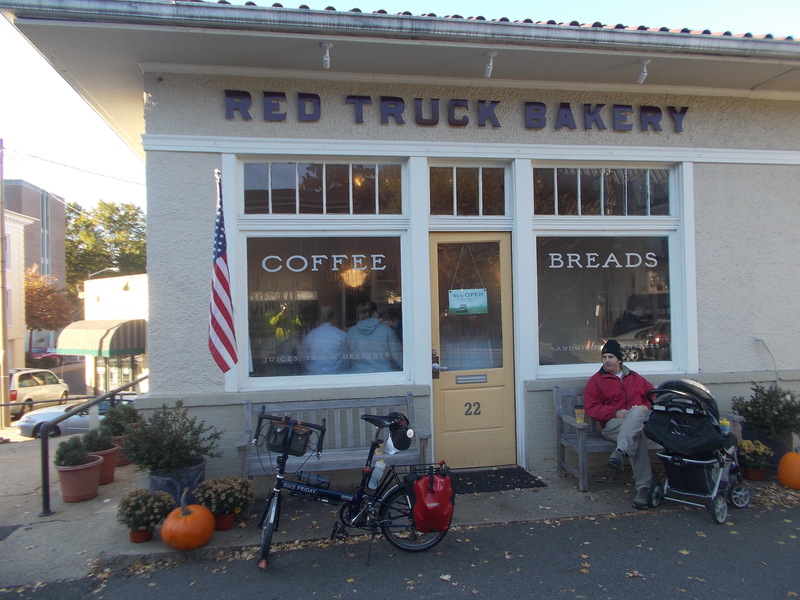 ), nut I made it to Firehook Bakery on Union Street in the heart of OldTownLand. I didn’t have high expectations for the coffee but I was pleasantly surprised by the French roast that I had. I also consumed an Italiano sammich. Not half bad. I’ll have to remember this place for future refuelings. My quad came back to life for the ride home, but I wasn’t setting any speed records. I called it a day after 14 miles. 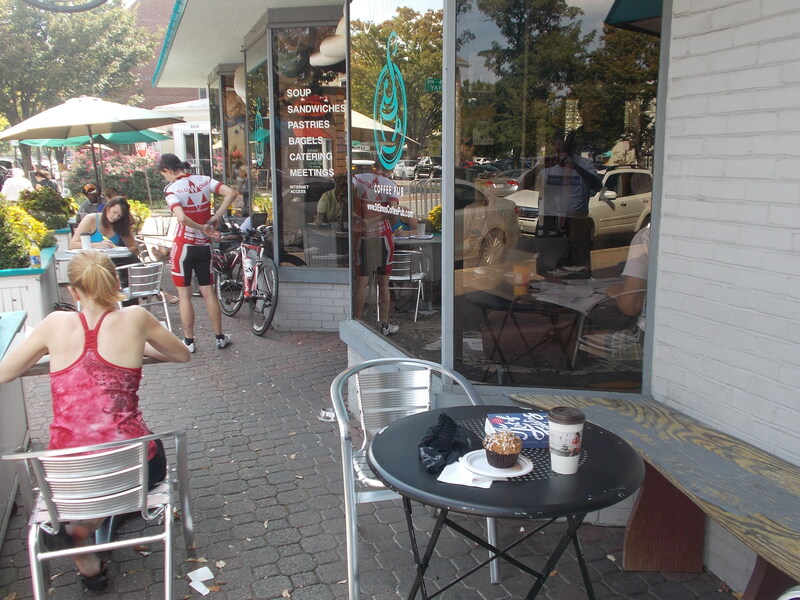 Observation: For a town on the Mount Vernon Trail, the East Coast Greenway, the Adventure Cycling Association Atlantic Coast and Tidewater Potomac routes, Old Town Alexandria has crappy bike parking. Which is to say, it has next to no bike parking. A friend of ours is out of town. She was donating her car, parked at her place on Capitol Hill, to charity. The charity failed to pick the car up yesterday. I decided to check out the situation today, a perfect excuse for a bike ride in to the city. Before I left home, I once again tweaked the new saddle on The Mule. I measured the fore/aft position of the saddle on Little Nellie. Little Nellie was custom made to replicate the configuration of The Mule. What I discovered was that the saddle on The Mule was one inch farther forward than the saddle on Little Nellie. So I slid The Mule’s saddle back and headed out for DC. I could tell right away that this little tweak was just what the doctor ordered. Just that one inch was all I needed to get my groove back on this bike. With a steady tailwind, I rode straight up the Mount Vernon Trail to DC. It felt great to be buzzing along feeling as if the bike and I were in sync. 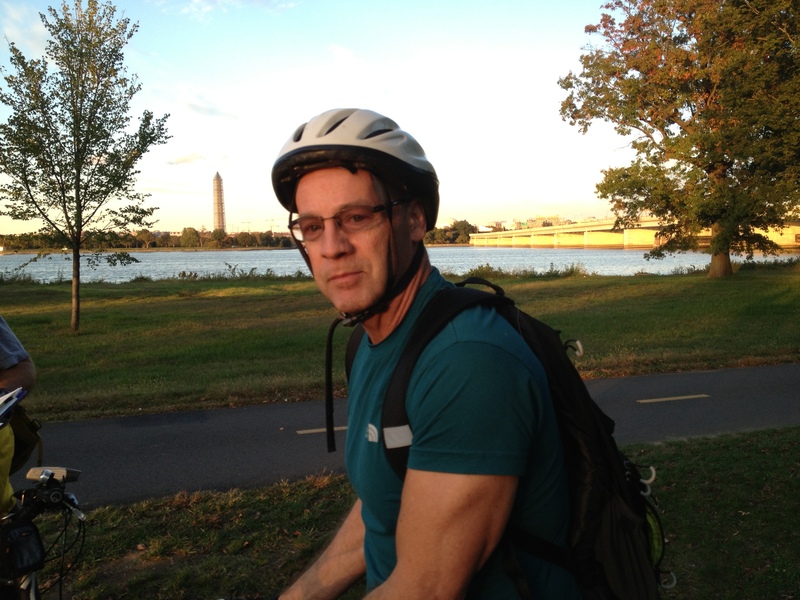 I rode down the National Mall hoping to spot some people I knew to no avail. I made my way to Capitol Hill and verified that our friend’s car had indeed been picked up. 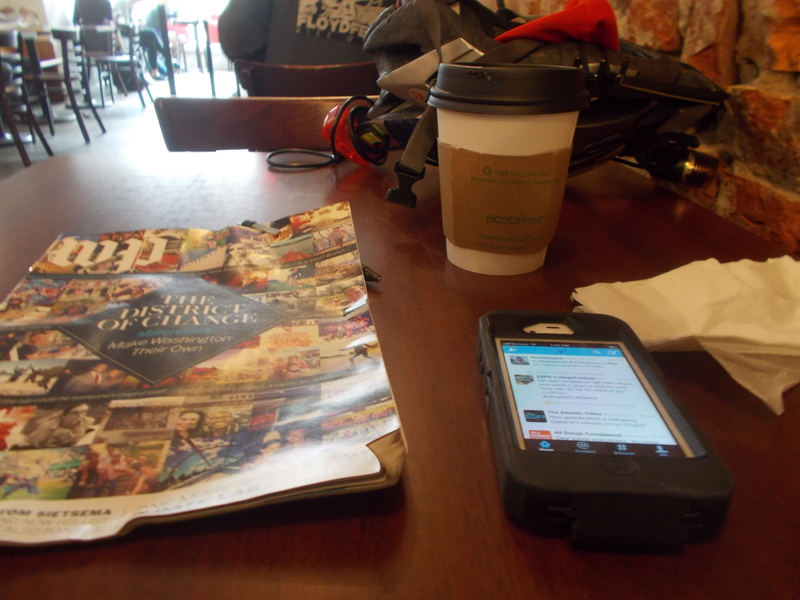 Since I had already used up two coffee shops at Eastern Market for earlier coffeeneuring adventures, I decided to head downtown for a cup of coffee at Chinatown Coffee Company. I learned of Chinatown Coffee from the Queen of Caffeine and her husband, the King of Espresso who stop there during the 50 States Ride. I had some Honduran coffee. It was as good as any coffee I’ve had so far. Right up there with Swings and St. Elmo’s. I was disappointed that they didn’t have much in the way of food. So I sipped the coffee and read the newspaper. I really like the ambiance of this place. I will definitely add it to my future coffee sorties. 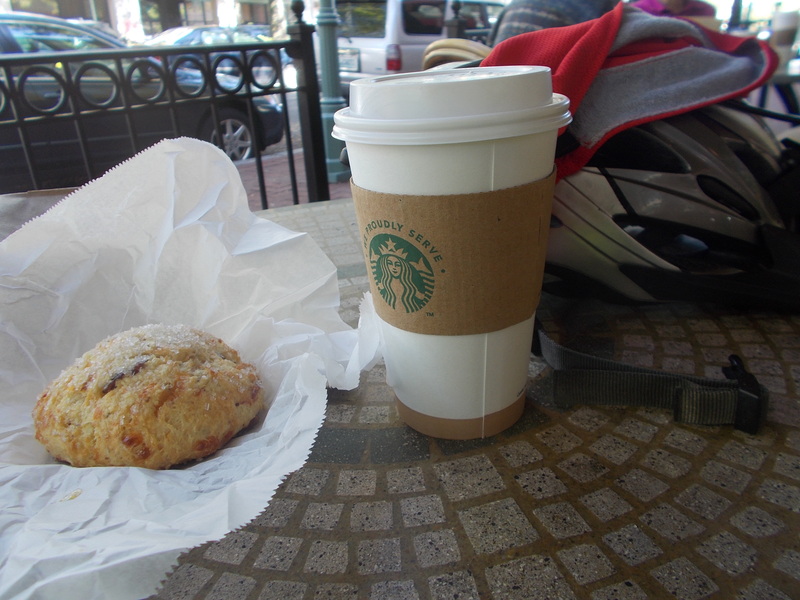 Properly caffeinated, I rode across downtown to White House Plaza. None of my peeps were going gaga over the prez, so I headed for home. On the way, I stopped at Belle View Shopping Center to check out a new bakery/restaurant that Nancy “Two Sheds” Duley tweeted about earlier in the day. The place isn’t open yet, but I had a long talk with the owners and admired the loaves of bread they had lined up on the window sill. 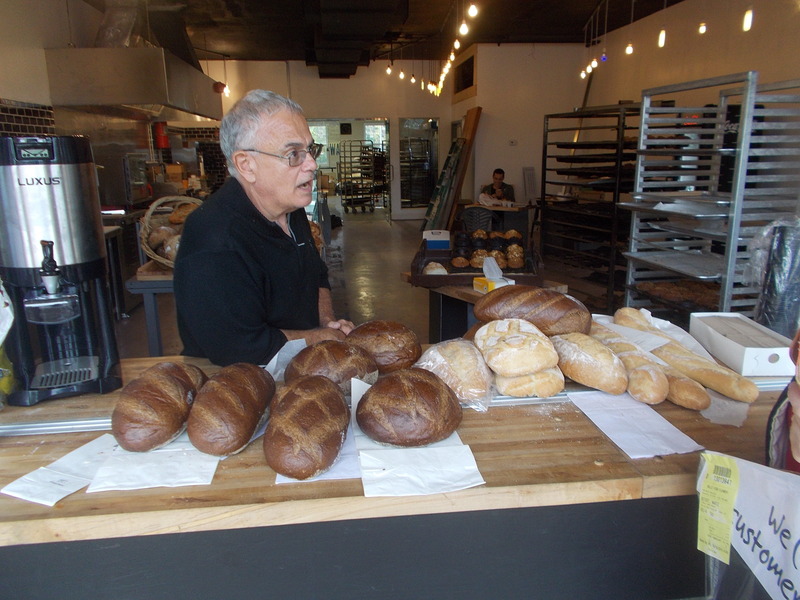 The owner gave me a loaf of French bread which he called 50 percent. It looked and smelled great but he was still fine tuning his baking products. He was confident that they all will be 100 percent. I am looking forward to that. 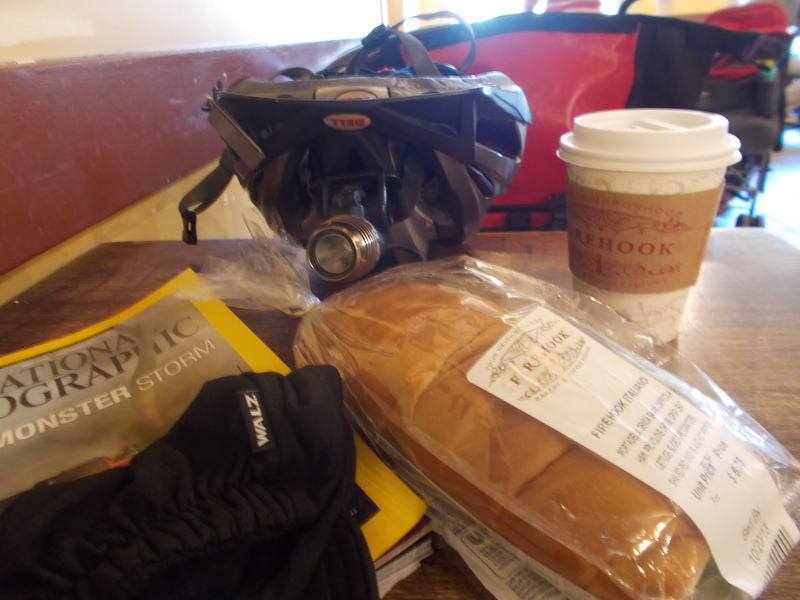 With le pain in le pannier, I headed for home. I tried out the new bike trail along side Fort Hunt Road. It’s a lovely trail but pretty much useless for getting anywhere. To get on it, you take a windy sidewalk that twists and turns. The path itself is wide and smooth but it winds left and right, up and down parallel to Fort Hunt Road which is a smooth steady climb. At one point I had to duck under a large tree limb, the remnant of an even bigger limb that had fallen over the trail. Add trail maintenance to the list of many things lacking in Fairfax County bicycle infrastructure. How sad it is that the bike trails and bike routes in Fairfax County, which is mostly suburban, is inferior to the trails, routes and cycle tracks in DC and Arlington.